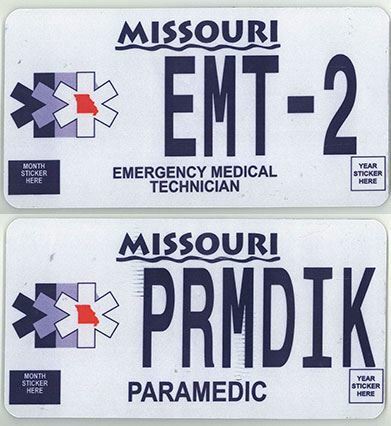 In order for you to continue using your EMT or Paramedic license plate in Missouri, you must pay an annual donation to MEMSA of $15 for a one-year registration or $30 for a two-year registration. If you need to renew your license plate, you will need to complete the renewal process. Step Two: Take your emblem authorization statement, your renewal notice and other documents required by the state (insurance card, paid property taxes, etc.) to your local DOR License Bureau to get your renewal tabs. Note: if you don't currently have an EMT or paramedic license plate, please follow the new/initial registration process outlined here.